As a correspondent for Fangoria, the world’s best-known horror magazine, I got to go on the set of quite a few scary flicks being made in and around the thriving metropolis of Vancouver, B.C. …okay, they were almost all bad. But I still had a gas doing them. Thanks Fango! And as a writer and editor for Vancouver’s Georgia Straight newspaper for over thirty years, I got to do a few horror covers when Halloween rolled around. For the Georgia Straight‘s Halloween 2000 issue I did a cover story on “bug wrangler” Brad McDonald, who I’d met while doing a Fangoria set visit for a film I can’t remember right now. The photo was taken by Vancouver’s amazing Alex Waterhouse-Hayward. One of my faves among my Straight cover stories was the Halloween 1999 issue, which showcased the work of Vancouver-based makeup-FX artists Toby Lindala, Ryan Nicholson, and Bill Terezakis. Yet again, Waterhouse-Hayward was the man who brought the story behind “The Gore Hounds” to blood-red life. For the Georgia Straight‘s Halloween 2003 issue I did a cover story on local indie-horror company Creepy Six Films, which featured company boss Vince D’Amato’s head being served on a film cannister. 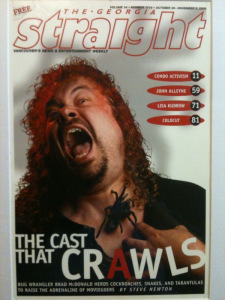 I’m pretty sure that’s the goriest cover the Straight has ever published, so I was proud to be a part of that. Again, the taboo-bashing Waterhouse-Hayward did the photographic damage. 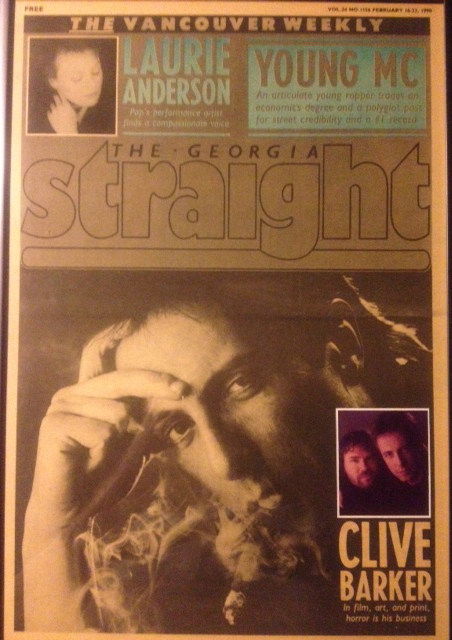 In advance of the release of 1990’s Nightbreed, British horror master Clive Barker came to Vancouver to do some press, and I got to interview him in the flesh. Alex Waterhouse-Hayward took a great shot of Barker puffing on a stogie, and was kind enough to take a quick Polaroid of us together, which I inserted on a cover before framing. 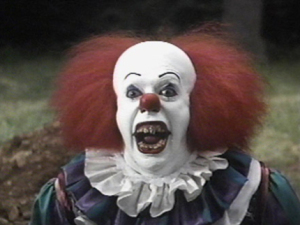 During my lucky 13 year stint as Fangoria‘s “man in Van” I was assigned to do a number of set visits, including ones for film and TV adaptations of Stephen King (Needful Things, IT) and Dean Koontz (Watchers, Hideaway, Intensity, Sole Survivor). 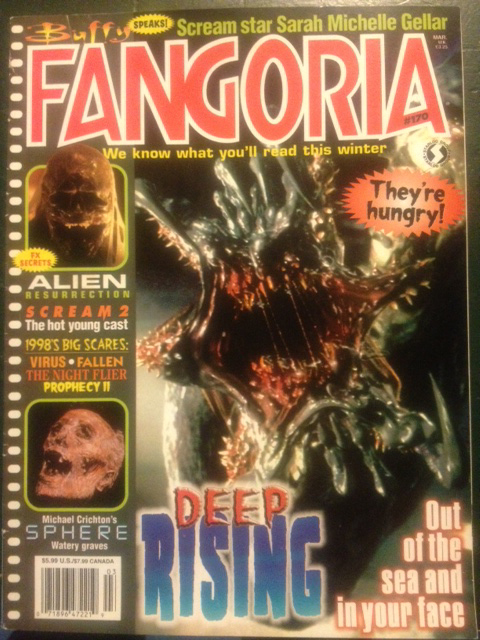 But none of my stories were ever the main image on the cover of Fango until Stephen Sommer’s 1998 action-horror Deep Rising. 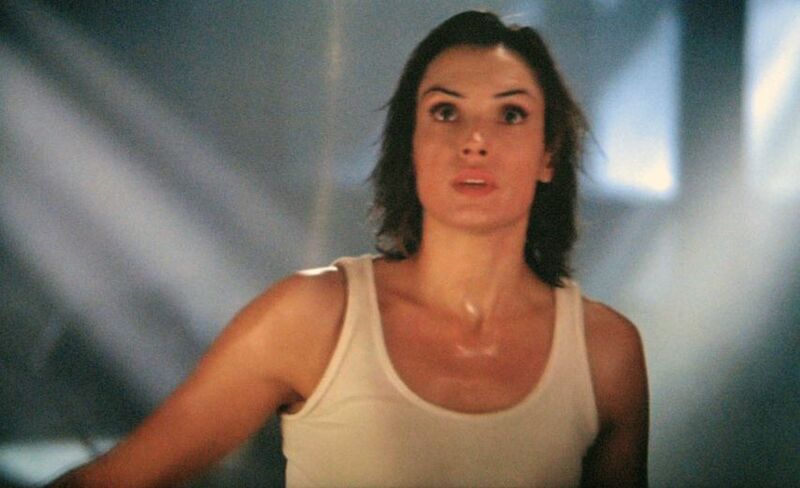 Although the movie turned out to be crap, I did get to hang out in Famke Janssen’s trailer for a bit.